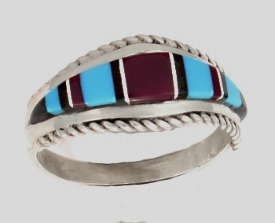 Pictured is a sterling silver ladies ring inlaid with turquoise, purple spiny oyster and jet. The ring has a twist wire border. It measures just over 1/2″ wide at top and tapers down. Inlay is only on the top part of the ring. Made by Zuni artisan Deirdre Luna. Size 7 1/2.